April 25, 2016 In News What is Michelle doing now? 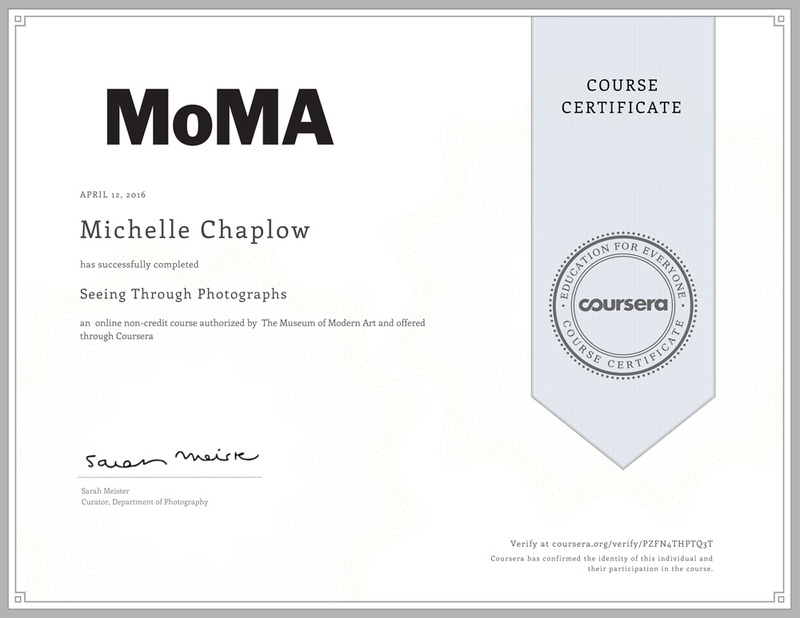 As part of the ‘Seeing through Photographs’ online course at the MoMA, Michelle wrote a blog entry about how stories become more powerful with photographs and how photographs can shape people’s opinions. Every person looking at an image will have a different interpretation based on their own personal experiences. What makes photography’s relationship with truth so complicated? The truth is so difficult to define; the truth for one person may not be the truth for another. There is an expression, “Tell the truth because the truth can´t hurt”. A visual of “truth” depicted within a photograph can indeed provoke a variety of emotions: it can evoke happiness, it can be consoling or it can cause emotional trauma. In my opinion, nothing is “reality” or “the truth”; we don´t know what is outside of the frame. Photographs have that magical false reality – they can´t possibly portray the truth, because who are we to say what is the truth is in the first place? In what ways do a photographer’s artistic choices and point of view affect the meaning of a picture? The angle, the viewpoint, the closeness or the distance will all alter the meaning and focus of an image. The artistic choices of the photographer during his or her creative process will affect the visual interpretation and narrative of the final photograph. Read Michelle’s blog post. As co-founder of andalucia.com in 1996, it was very important to celebrate this huge landmark of 20 years in appropriate style, marking the development from the initial days of two early adopters (Michelle and her partner Chris) working from the lounge of a small apartment, to a fully-fledged business with one of Spain’s top websites boasting 10,000 pages. The day-long celebration for 50 guests included a treasure hunt in teams, in locations in and around Estepona, whose streets were blooming with spring flowers; a Keynote speech by Andalucia.com MD Chris Chaplow tracing the history of the website and mentioning some of its key staff members; and a delicious lunch at the Venta Garcia in Casares, where the winning teams from the treasure hunt were presented with framed limited edition photographic prints by Michelle. A mix of nationalities took part in the day, with many Spanish and English journalists, as well as friends, clients, and past and present employees. April had a double celebration – not only the 20th anniversary of Andalucia.com, but Michelle’s final grades came back after completing all six modules of the course – she scored an impressive 91%. Discover photography’s roots in both art and science by observing the diverse ways the medium has been used across time to capture a single subject familiar to us all.